The Round Dining Table by Oios Metals. The top features a beautiful copper Nova variegated tone, and is available in up to a 60" diameter. The beauty of it is made even better with a hand crafted brushed linear pattern. The pedestal base is finished in a matte oil rubbed bronze powder-coat, and is scaled proportionately to the diameter of top that's ordered. The top is available in a few different finishes. For durability and ease of use, the top is finished in a textured clear coat. This makes the surface very durable, scratch and heat resistant, and user friendly. It doesn't show fingerprints and dust like a typical glass or wood dining table. 100% Made in the U.S.A. The Mercury II Round Dining Table by Oios Metals. The top features a beautiful variegated Tuscan finish. The beauty of it is made even better with a hand crafted brushed linear pattern and a scribble accent that runs randomly across the table top. The four leg base is open and airy, and is finished in a rich oil rubbed bronze powder-coat. For durability and ease of use, the top is finished in a textured clear coat. This makes the surface very durable, scratch and heat resistant, and user friendly. It doesn't show fingerprints and dust like a typical glass or wood dining table. 100% Made in the U.S.A. The Mercury I Round Dining Table by Oios Metals. The top features a beautiful stainless finish. The beauty of it is made even better with a hand crafted brushed linear pattern. The four leg base is open and airy, and is finished in a matte deep gray powder-coat. There is a unique sphere accent affixed to a base plate. The alternate color way is a copper Nova top and sphere, with the legs finished in a deep oil rubbed bronze powder-coat finish. For durability and ease of use, the top is finished in a textured clear coat. This makes the surface very durable, scratch and heat resistant, and user friendly. It doesn't show fingerprints and dust like a typical glass or wood dining table. 100% Made in the U.S.A. 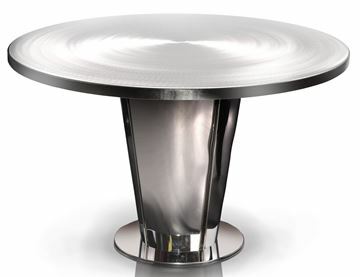 The Mercury II Round Dining Table by Oios Metals. The top features a beautiful variegated raw steel tone. The beauty of it is made even better with a hand crafted brushed linear pattern. The four leg base is open and airy, and is finished in a black powder-coat. For durability and ease of use, the top is finished in a textured clear coat. This makes the surface very durable, scratch and heat resistant, and user friendly. It doesn't show fingerprints and dust like a typical glass or wood dining table. 100% Made in the U.S.A. The Mercury I Round Dining Table by Oios Metals. The top features a beautiful copper Nova variegated tone. The beauty of it is made even better with a hand crafted brushed linear pattern. The four leg base is open and airy, and is finished in a matte bronze powder-coat. There is a unique sphere accent affixed to a base plate. The alternate color way is a brushed stainless top and sphere, with the legs finished in a deep gray powder-coat finish. For durability and ease of use, the top is finished in a textured clear coat. This makes the surface very durable, scratch and heat resistant, and user friendly. It doesn't show fingerprints and dust like a typical glass or wood dining table. 100% Made in the U.S.A. The Jupiter Dining Table by Oios Metals. The top features a generous boat shape, giving extra seating room for your company. The beautiful top is finished in brushed steel, hand crafted in an iridescent light anthracite color with a brushed linear pattern. Occasional sparkles in the finish add to the complexity and unique play with light that makes this such an amazing design. The center column is brushed steel, and the base plate is finished in the same light anthracite color as the dining table top. For durability and ease of use, the top is finished in a textured clear coat. This makes the surface very durable, scratch and heat resistant, and user friendly. It doesn't show fingerprints and dust like a typical glass or wood dining table. 100% Made in the U.S.A. The Roma Dining Table by Oios Metals. The top features a beautiful top finished in brushed steel, hand crafted in an iridescent steel spiral pattern. For durability and ease of use, the top is finished in a textured clear coat. This makes the surface very durable, scratch and heat resistant, and user friendly. It doesn't show fingerprints and dust like a typical glass or wood dining table. The base is crafted in polished stainless steel. 100% Made in the U.S.A.